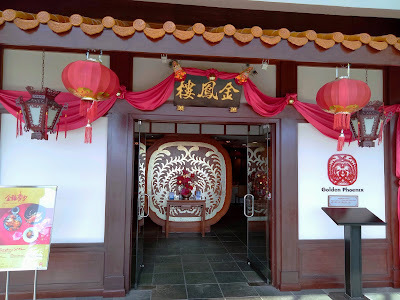 Golden Phoenix (金凤楼) is the Chinese restaurant in Hotel Equatorial Penang. Located one floor below The View, the restaurant has an entrance that resembles a classic Chinese inn (客栈). 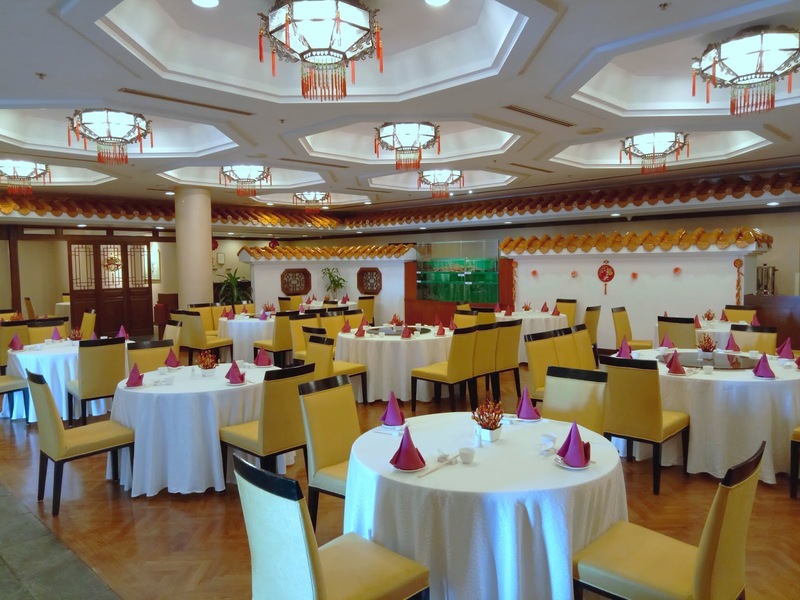 The dining area is decorated with fancy ornaments like Chinese lanterns and porcelain tea sets. Further back, there are several fish tanks where seafood is kept live until preparation. Taking the helm in the kitchen is Executive Chinese Chef Lai, who has accumulated several decades of culinary experience under his belt. For many years, Golden Phoenix has established a good reputation for its daily dim sum (点心). 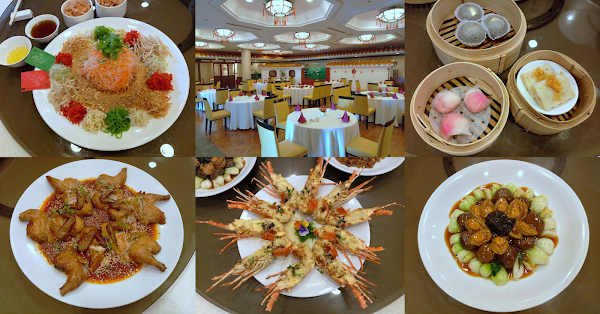 In conjunction with the upcoming Chinese New Year, the restaurant is introducing several new types of dim sum. 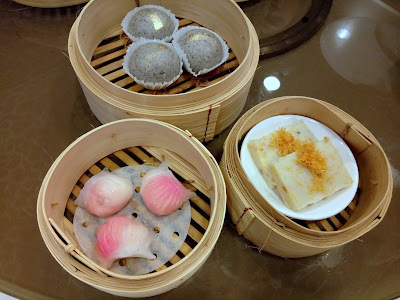 For example, Har Kow With Beetroot Juice (樱花鲜虾饺) is a shrimp dumpling with translucent, vinegar-laced skin. Next, Dried Scallop With Butternut Pumpkin Cake (干贝奶油瓜糕) resembles radish cake (萝卜糕) but is sweeter. Last but not least, Black Sesame Bao With Lava Salted Egg Yolk (黑芝麻流沙包) oozes yellowish paste as soon as the bun is punctured. 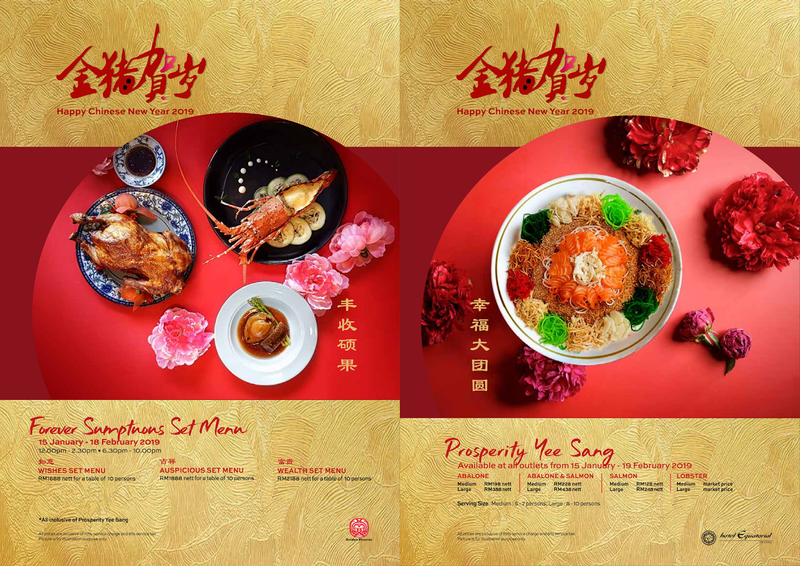 In addition to serving dim sum, Golden Phoenix is also offering 8-course dinner every day from 15 January 2019 to 18 February 2019. The dishes this year are specially crafted by Chef Steve, who has served in several prestigious resorts throughout his career. 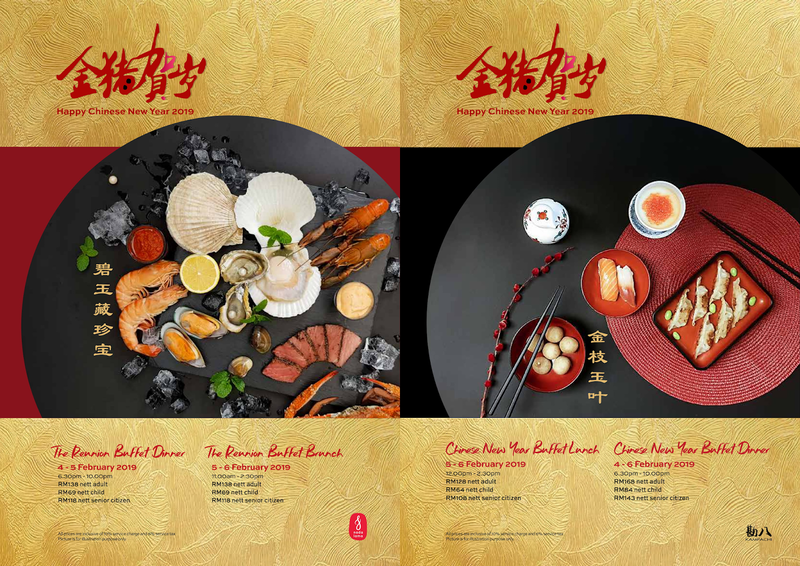 There are three choices in the Forever Sumptuous Set Menu. 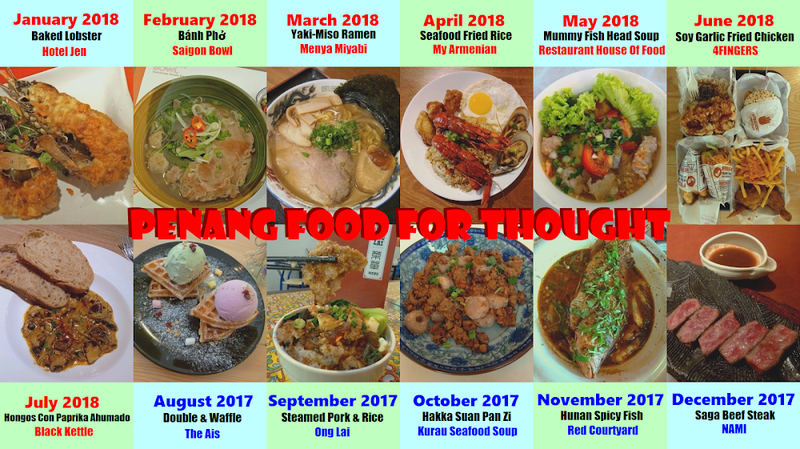 For the purpose of today's preview, Chef Steve has handpicked a combination of dishes across different menus in order to showcase his masterpieces. Chinese reunion dinner customarily begins with a jolly tossing of yee sang (鱼生). 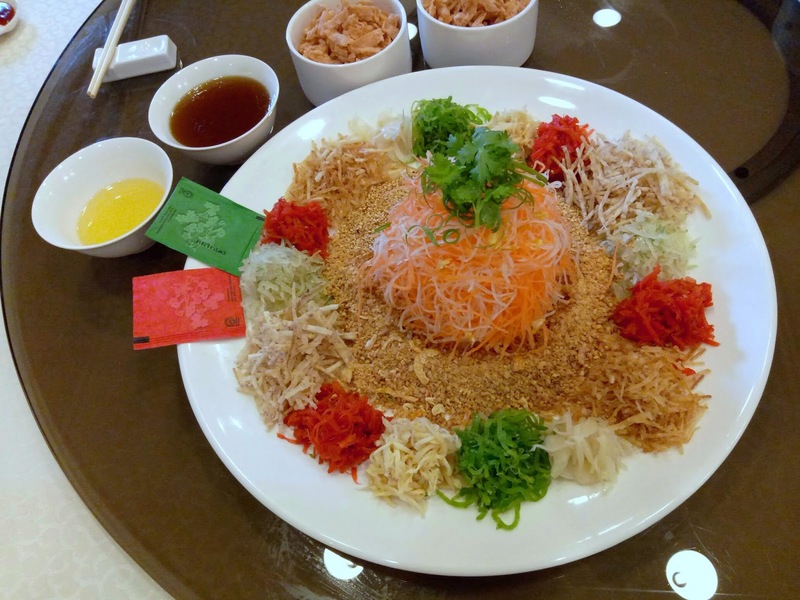 For the Prosperity Salmon Yee Sang & Pear (三文雪梨鱼生), the appetizer comprises of a plethora of colorful ingredients including smoked salmon, jellyfish, shredded vegetables, snow pears, crackers and crushed peanuts. It is believed that tossing yee sang brings one good fortune. The next dish, Braised Sundried Seafood With Crab Meat In Brown Sauce (红烧瑶柱蟹肉海味羹), contains premium seafood ingredients like crab meat and dried scallops. A dash of vinegar accentuates the savoriness of this delicacy. The thick soup resembles shark fin soup but does not contain any actual sharks fins. 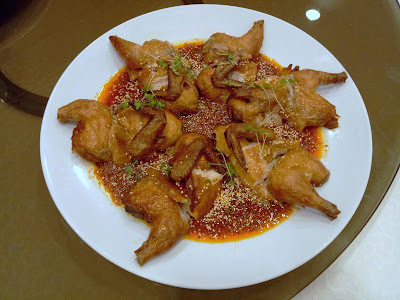 Roasted Spring Chicken With Szechuan Hot & Spicy Sauce (吊烧麻辣幼子鸡) is the poultry dish today. The spring chicken, imported from China, requires a tedious process to prepare. The chicken is flavored with spicy Sichuanese sauce that contains dried chili peppers, shallots and the infamous Sichuan peppers (花椒). Fortunately, the sauce is not too numbing to my tongue. 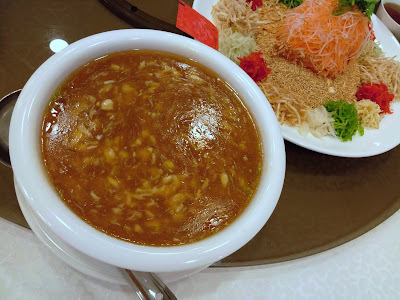 Moving to seafood, Steamed Pearl Grouper With Superior Light Soya Sauce (清蒸游水龙虎斑) is a delicacy indeed. 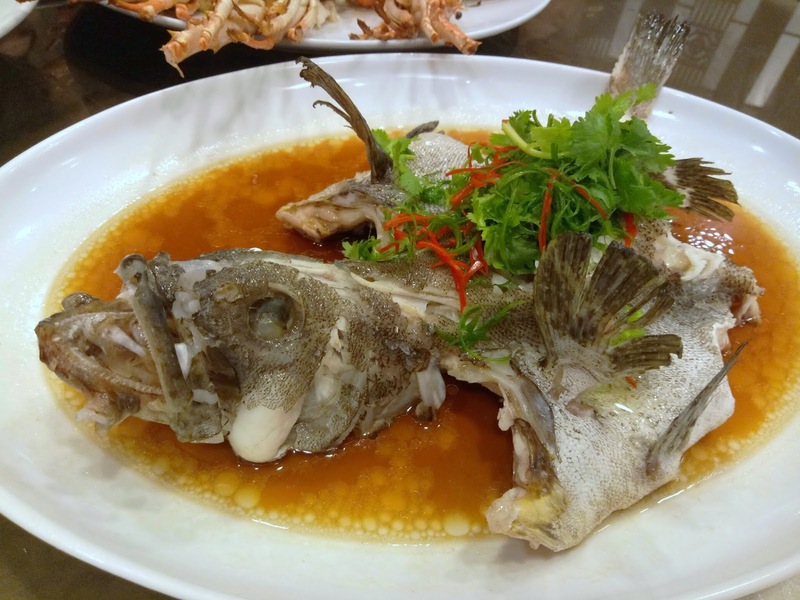 Pearl grouper is prized for its refined texture. Flavored with superior soy sauce, the fish is absolutely succulent to the last morsel. The mild taste of soy sauce allows the fish's freshness to truly shine. 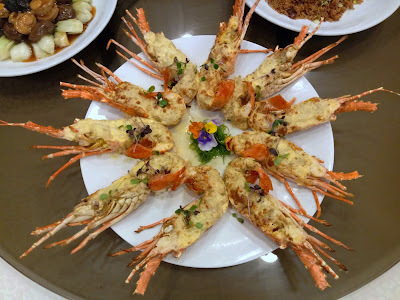 Today's main highlight is Oven Baked Baby Lobster With Vegetarian Ham & Cheese (芝士烧焗龙虾仔). Juvenile Australian lobsters are used. Elegantly seasoned, the lobsters are baked with a cheesy crust that strikes a chord with my palate. Despite the amount of cheese, I am surprised that the lobsters are not surfeiting at all! 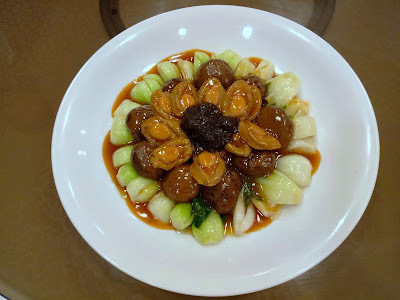 The next dish to delight my palate is Braised Dried Oysters With Japanese Mushroom & Vegetable (蚝士扒日本太白菇烩双蔬). The abalones, weighing 60 grams each, are gratifying indeed. They are accompanied by Korean dried oysters and Japanese flower mushrooms (花菇). Juicy bok choy (小白菜) serves as counterbalance to the savory ingredients. Fragrant Rice With Chicken Sausage (腊味饭) fills my nostrils with appetizing aroma. 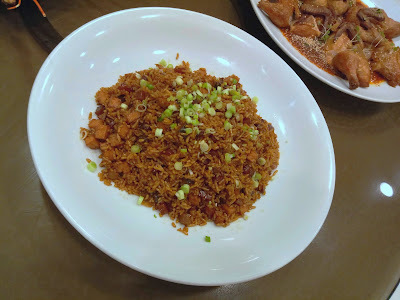 Served with Chinese sausages (腊肠), the fried rice is also garnished with chopped scallions for aesthetic appeal. Nian gao (年糕) is a traditional Chinese snack that is soft and sticky. It is considered auspicious to have nian gao for Chinese New Year because its Chinese name is a homonym for "higher year" (年高). 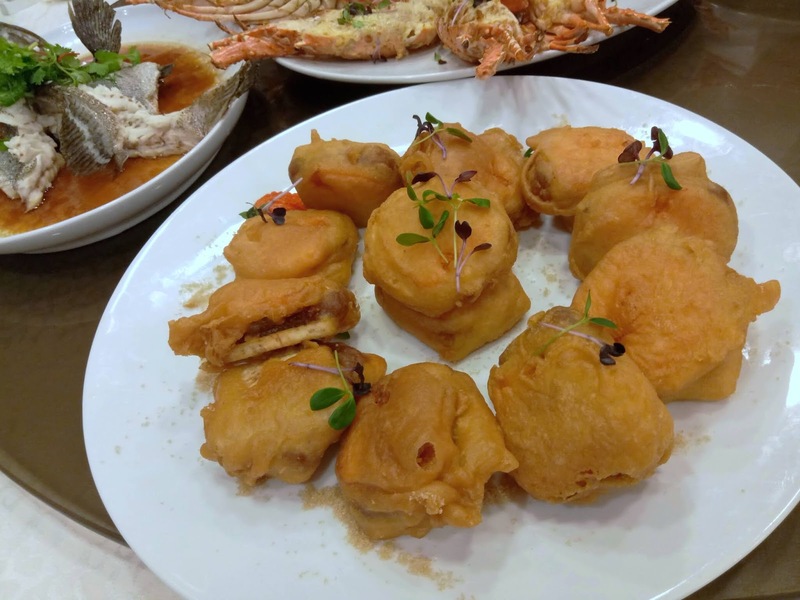 For today's dessert, Deep Fried Chinese New Year's Cake With Yam & Potato (芋香金薯炸年糕), nian gao slices are sandwiched between taro and sweet potato, and then deep-fried to golden perfection. The sweetness level is ideal. 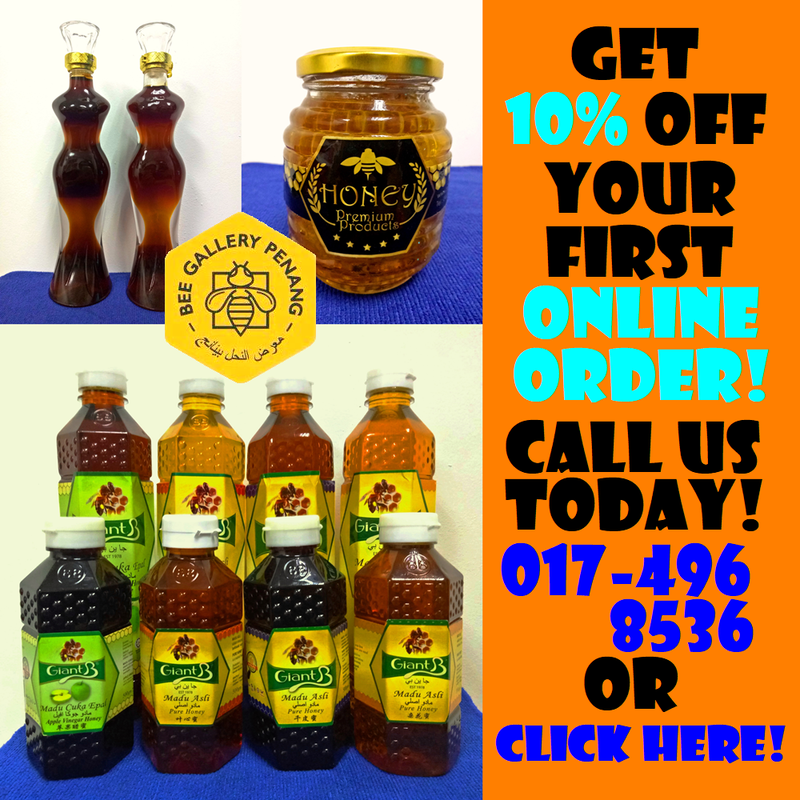 Golden Phoenix spares no expense in using premium ingredients from around the world. 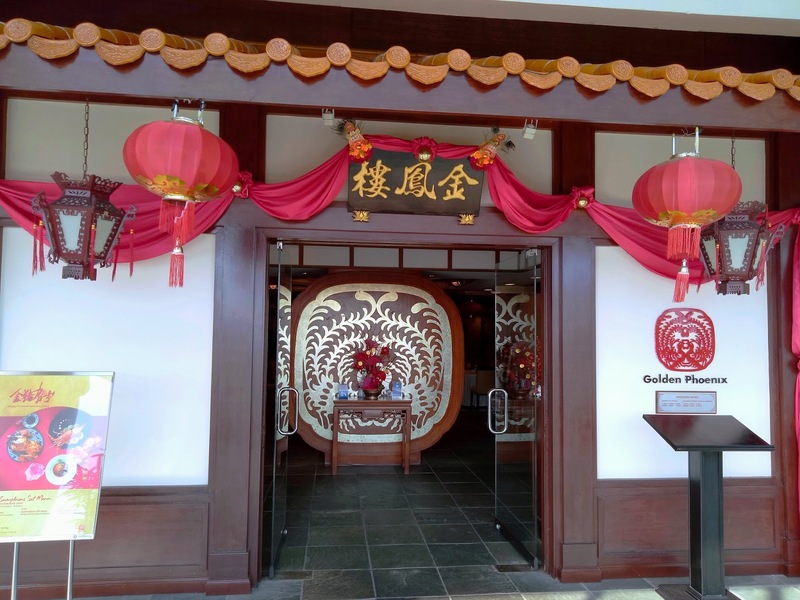 Like other restaurants in Hotel Equatorial Penang, Golden Phoenix does not serve pork. Alternatively, diners can opt for buffet meals at nada lama and Kampachi. Directions: Hotel Equatorial Penang is located near the intersection of Persiaran Bukit Jambul and Lebuh Bukit Jambul. Jalan Bukit Jambul is a small offshoot from Persiaran Bukit Jambul near this intersection. 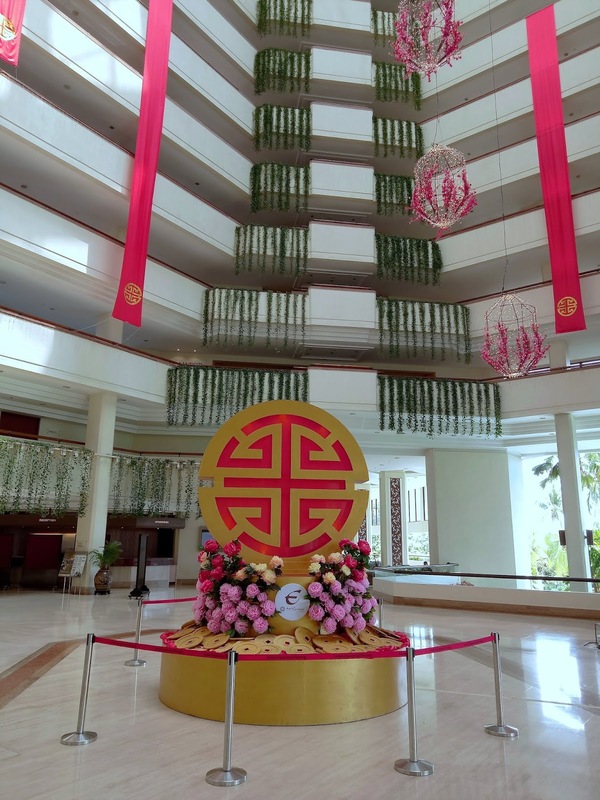 Golden Phoenix is located one level below the main lobby. The hotel provides multilevel parking for RM10.00 per entry.